I have read mostly horror novels this month, and not only for the R.I.P. Challenge and Wonderfully Wicked Read-a-thon! 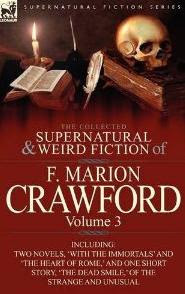 So to keep up with the Halloween spirit, I read a short story by American author Francis Marion Crawford. It is a gothic tale called The Dead Smile. "It was a low-moaning voice, one that rose suddenly, like the scream of storm. Then it went from a moan to a wail, from a wail to a howl, and from a howl to the shriek of the tortured dead. He who has heard it before knows, and he can bear witness that the cry of the banshee is an evil cry to hear alone in the deep night." The themes of the story are lies, secrets and forbidden love, combined with the supernatural. The story is wonderfully written and has in every way the aethetic beauty of gothic literature. The descriptions are so vivid and at times, gruesome, that you can almost see the scenes unfold before your eyes. That being said, the plot is awfully predictable and riddled with loopholes. As long as you don't try to make sense of every action, the story is a beautiful and touching read. You can read it here. Short Stories on Wednesday is a bookish meme hosted at Risa's Bread Crumb Reads. As long as you don't try to make sense of every action, the story is a beautiful and touching read. I feel like that about certain movies too - beautiful acting and visuals, but a plot riddled with holes, and I don't know whether to call it a good movie or not. Sometimes I'm willing to overlook such structural weaknesses, other times not, and I'm not always sure why. I guess if enough of the story is good or if there are enough strong elements to it. Other times I just get fed up. HKatz - That's true. I am usually not the kind of person who'd say that; in fact, I find it kind of absurd when people say such things! In this case, though, I think the structural weakness has a lot to do with the time this story was written - so it was easy to dismiss it!